A 49-year-old U.S. woman has given birth to her grandson after her daughter was precluded from becoming pregnant because of a heart condition. 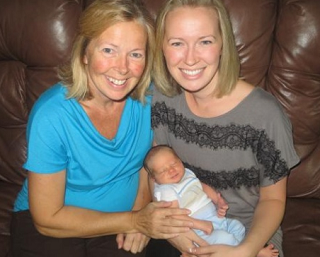 The Portland Press Herald newspaper reports that Linda Sirois gave birth on Aug. 13 for her daughter, Angel. Twenty-five-year-old Angel Hebert says her baby is "eating like a champ and he doesn't fuss too much." Linda said she's offered for years to become a gestational surrogate for Angel if a doctor said she shouldn't become pregnant. Angel Hebert says she and husband Brian Hebert got that word last summer. Linda has four children, including twins, and her youngest kids are in college. Linda last gave birth to twins 20 years ago. She says she thinks this pregnancy might have been her easiest. -- A how-to guide to Surrogacy. It covers Gestational Surrogacy via IVF as well as Traditional Surrogacy via Artificial Insemination. You will learn about the legal, medical, as well as the emotional aspects of choosing Surrogacy as your pathway to parenthood. You will be given the pros and cons of using an agency as well as going about it on your own.